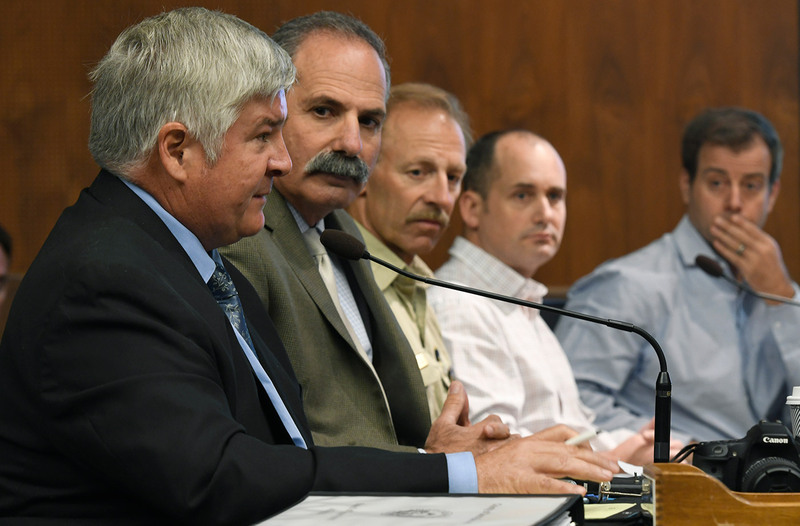 County Public Works Director Tom Fayram (left) addresses county supervisors with (from left) Office of Emergency Management Director Rob Lewin and the U.S. Forest Service’s Kevin Cooper, among others. Shrubs with deep roots are sprouting a little new growth, but, crucially, the grasses have not come back, he said. By comparison, a year after 2009’s Jesusita Fire burned 8,700 acres above Santa Barbara, upward of 80 percent of the vegetation had returned, including grasses four feet high. What the poor vegetation recovery means, said OEM Director Rob Lewin, is that the county will keep the current rainfall threshold for evacuations, 0.5 inches of rain per hour. 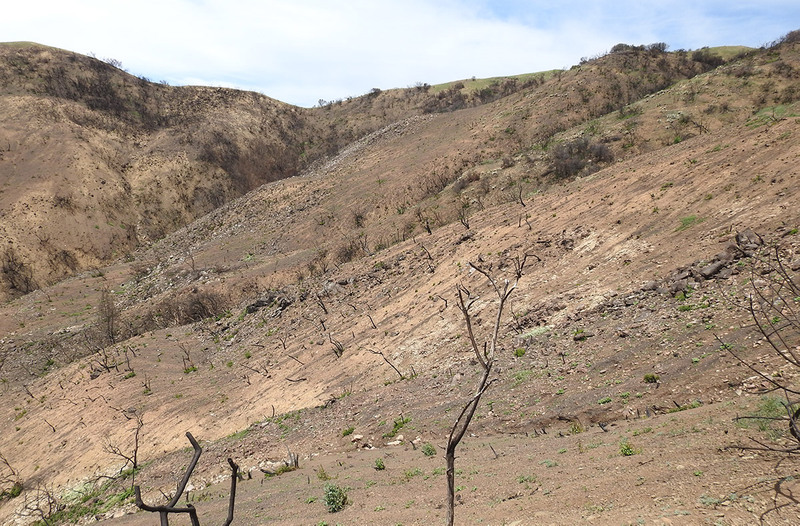 Only 5-10 percent of the burned vegetation has so far regrown, as the upper reaches of the Cold Springs Canyon demonstrate. This means evacuations will continue next rain season as before. On Tuesday, county supervisors — after hearing a boiled-down presentation of the scientists’ collective assessment — struggled to identify preventive action that might make a difference should the South Coast get pelted by intense rain in the near future. Supervisor Das Williams asked whether the hillsides could be stabilized with hydromulching or an aggressive seeding program. Part of the problem, said Cooper, is the steepness of the hillsides. Any plant-based stabilization effort, he said, would be quickly washed away by heavy rains, given that most of the hillsides above Montecito have slopes in excess of 60 degrees. Supervisor Williams suggested Supervisor Adam was not aware of just how much controlled burning still takes place, prompting Adam to respectfully disagree with Williams. “There’s hardly any being done,” he insisted, suggesting a program of 3,000-acre checkerboards be ignited via “heli-torch.” Controlled burns typically have taken place in cooler months, but with fire season expanding nearly year-round, Williams suggested the opportunity for controlled burns has greatly diminished. A Burned Area Emergency Response (BAER) team member traverses the scoured canyon bottom up the San Ysidro drainage. Supervisor Joan Hartmann asked whether new debris basins were needed. Fayram replied that the U.S. Army Corps of Engineers was currently assessing that very issue, but he cautioned that debris basins are “very difficult” to site — they’re large, unsightly, expensive, and fraught with environmental vulnerabilities. According to all assessments, the county’s battery of debris basins — most installed higher up in the foothills in the wake of a 1964 fire-and-flood combination that triggered a serious debris flow — helped blunt a significant amount of the fury. Supervisor Janet Wolf asked whether K-rails could be installed upslope to redirect any future debris flows. That idea was considered, she was told, but rejected. Given that Montecito was built atop a network of successive debris-flow deposits, geologists cautioned that it’s exceptionally difficult to predict which path future debris flows might take. One geologist described a debris flow as a “bouldering surge” carried rapidly along by “rolling concrete.” To the extent such force could be anticipated, he said, K-rails would be useless in stopping it. 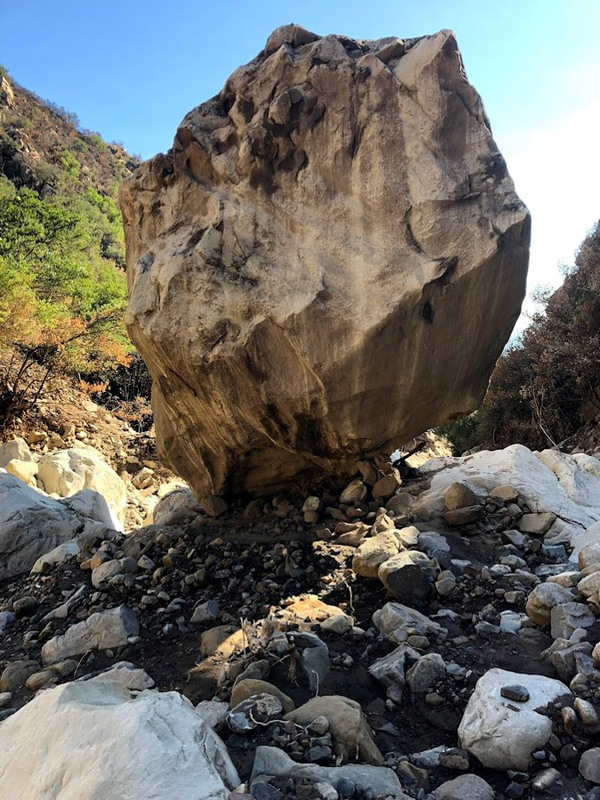 A 20-foot-tall rock dug out of the San Ysidro Canyon landscape by the debris flow exemplifies the debris dangers that remain post-flood. 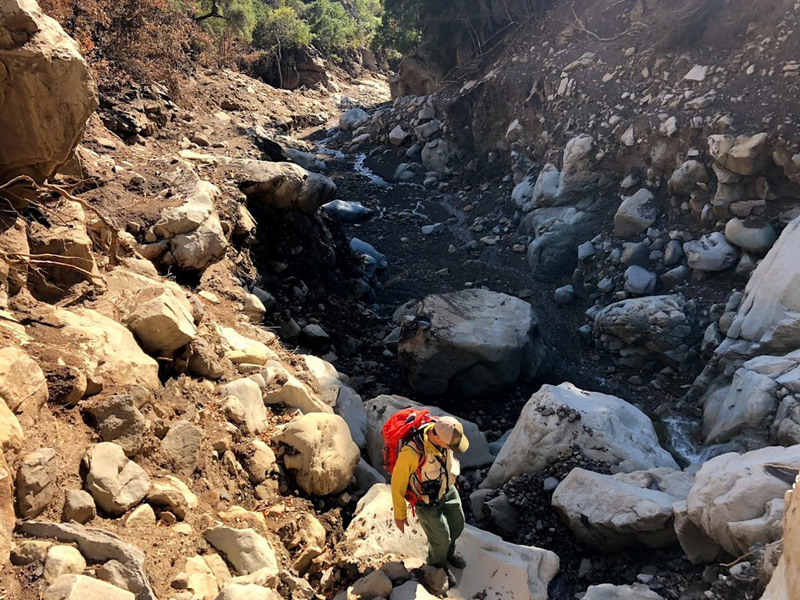 Despite the exceptional nature of this year’s disaster, supervisors were warned that debris flows are an inevitable outgrowth of the region’s fire-and-flood rhythm. There have been 63 major fires since 1913 and seriously destructive debris flows in 1964, 1971, 2017, and 2018. This year’s was, admittedly, “a maximum magnitude event,” said Cal Fire’s Drew Coe, but less-than-maximum events are fully capable of destroying homes and killing people. With the county strapped for cash, a group of wealthy, civic-minded Montecitans — calling themselves The Partnership for Resilient Communities — donated $140,000 to the county to help cover the cost of consultants to explore possible strategies for coping with hillsides rendered deadly with the addition of intense rains. The group includes attorney Joe Cole, who currently chairs the Montecito Planning Commission (and is the former publisher of this newspaper); former Santa Barbara City Fire chief Pat McElroy; political consultant Mary Rose; and entrepreneur Brett Matthews, among others. They have already hired one emergency response planning consultant assigned to the county’s Office of Emergency Management as well as the services of James Lee Witt, who was the FEMA director during the presidency of Bill Clinton. The county supervisors approved spending $104,000 to reestablish 70 land survey monuments — critical to determine exact property lines — that were destroyed in the fire and debris flow. Lastly, the supervisors approved a contract with a private law firm in preparation of filing a lawsuit against Southern California Edison on the grounds that its negligence was responsible for the Thomas Fire, which in turn created the preconditions for the 1/9 Debris Flow. SoCal Edison has been sued by multiple parties — including the City of Santa Barbara — on similar grounds. SoCal Edison has responded to all such claims that the cause of the fire is still under investigation.